Welcome by the Really Reasonable Ribbon Blog again today, everyone! It's Karen Letchworth here today sharing a cute little birthday card I made using some fun trims from Really Reasonable Ribbon. 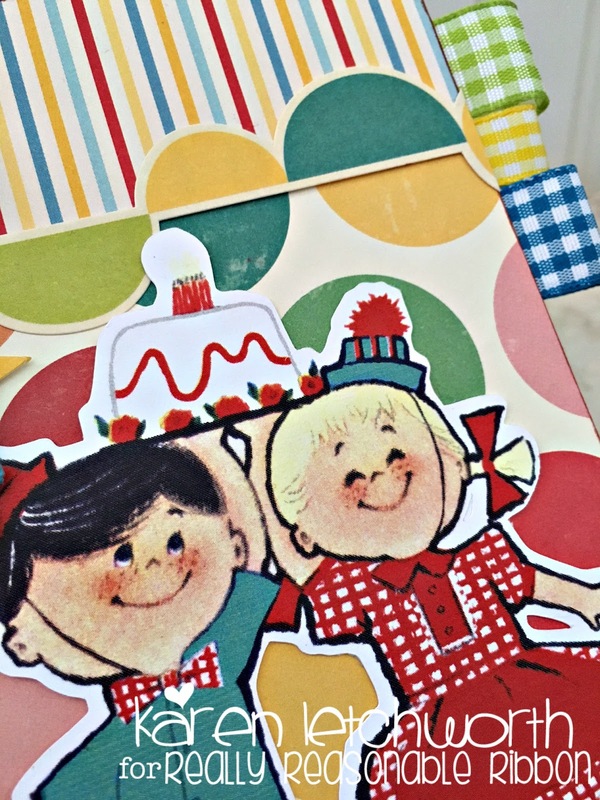 I used two patterned papers, some little ephemera pieces, chipboard, stickers, and decorative touches. Then, I added a lovely bow at the top left using Red & White Plaid Houndstooth Ribbon, Solid Lemonwood Baker's Twine and Solid Blue Baker's Twine. I placed a Rhinestone Embellishment in the center of my bow. I also don't want to forget to mention that my card is held together with LOTS of Scor-Tape. It's such an awesome adhesive. Then, just for fun.....I added a snippet of 3/8" Yellow Gingham Ribbon, Turquoise Gingham Ribbon, and Green Apple Gingham Ribbon to the right side of my card. All of the ribbons, trims, and embellishments at Really Reasonable Ribbon work together to compliment one another. This fun card with all its bright colors is no challenge for RRR.....they really do have EVERY color you could possibly need. Why not check it out for yourself? You're sure to find the perfect trims and goodies for your next project. 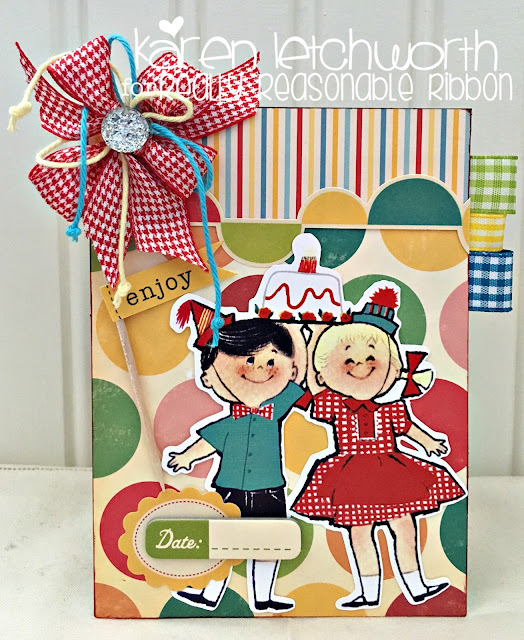 There's also always a fun challenge taking place on the Really Reasonable Ribbon Blog, and we love seeing your ribbony projects, so be sure to stop by and play along. Thanks so much for visiting, and have a great week! Thanks again for stopping by. We hope you'll take time to visit the Really Reasonable Ribbon store to see what's new. This is so fun and bright and cheery!! Love ALL those fabulous ribbons and how it makes it feel like a party!! 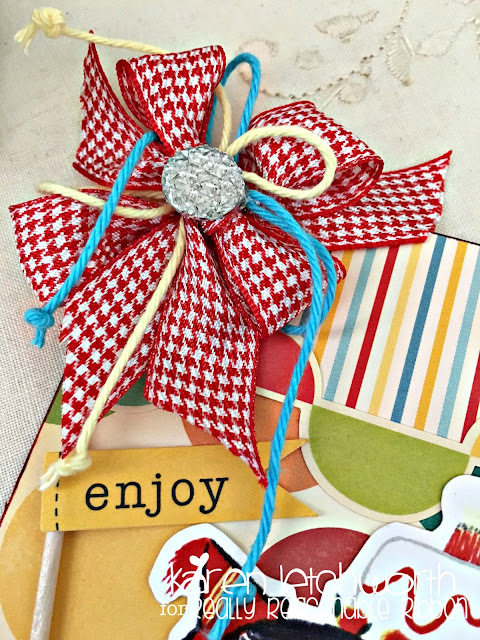 Didn't know that houndstooth went with gingham and twine so well! !